Edward J. Jeffs’ Prince of Mulberry Street is a modern adaptation of Sophocles’ famous tragedy, Oedipus Rex. Taking place at the turn of the 19th century (late 1800s), Jeffs’ verse play is brought to life by various musical scores, intriguing chorus singers, and the silent dance that takes place during the most important scenes of the play. The story is set in New York during the Diaspora, when immigrants from all over the world traveled to America to seek a better life for themselves and their families. 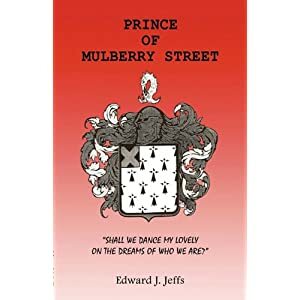 Revolving around the character of Jeremy, Prince of Mulberry Street follows him from the time he is adopted all the way to old age. Like Oedipus, Jeremy encounters his biological father by fate: he is sitting at a bar when he is challenged to a duel by an old man. The old man tastes the defeat and death that are soon to be his, but it is Jeremy who suffers a most unusual and unfortunate of fates, when upon seeing Ruth, now widowed, his heart clamors for her. Jeremy and Ruth marry and have two beautiful kids. However, Ruth is still uneasy regarding her first husband’s death and is adamant about learning the truth. Despite having no interest in this search, a hesitant Jeremy begins the journey that takes him from a happily married man to a wretch that has killed his father, unknowingly married his mother, and fathered her kids. Just as in Sophocles’ tragedy, Jeremy gouges his eyes and leads a meaningless existence begging on the streets, while Ruth ends her life upon hearing the news. From the beginning to the end, Prince of Mulberry Street , will intrigue readers with various themes of love, old age, cycles of life, redemption, fate, and more—all integrated within musical sequences. Songs like “Just the World and Us,” “I would begin again,” “It is All Over,” and “The Blindness of Men,” are introduced with perfect timing that punctuate the impact of the scenes. The lyrical structure is captivating and evokes a visualization of the scenes in a powerful manner. For classical literature aficionados, Prince of Mulberry Street , is a quick and innovative read that is ripe for analysis in connection with Oedipus Rex. As a past theatre major in college and a theatre junkie in high school I have read my share of plays/musicals and seen many in production as well. I have read the original Oedipus Rex, and while this was a play that was definitely full of allegory and metaphor, it was never my favorite tale, as the underlying message was always a bit disturbing. This modern rendition of the play follows the overall storyline of the original in a more modern day tale (well, late 1800's at least). The story itself was strong and I could tell that the author was doing a good job at working to stay true to the original while working to incorporate and make the tale true to the modern day reality in which it was set. While I did not have the music, you can tell that the music plays a strong part in the tale itself and I had wished that I could have heard it to see how the lyrics and verse go hand-in-hand together. All-in-all for anyone who was a fan of the original text, you will enjoy this as well. I encourage you to heck it out and see what your thoughts are and how well you feel it stays with the original storyline.